Last month’s Finding Your Home’s History proved to be very popular among our readers. So much so that our Cataloguing Team Leader Kate Bevan has agreed to write a total of four installments, each post detailing on how she set about discovering her home’s past. In my last post I began to look at the history of my house in Swindon. By looking at maps of the town from the 19th century, and the title deeds of the house, I found that it was built between 1877 and 1890, when the town was rapidly expanding because of the growth of the railway industry. I next wanted to have a look at the building itself, whether there were any clues to confirm the construction date, and whether there were any original features left from the Victorian times. I started off by reading a little about Victorian architecture. One book which I found very useful was The Victorian House Explained by T Yorke – this included detailed descriptions of the changes in architecture and building methods during the period, and even included helpful sketches to illustrate these developments. In the early Victorian period, terraced workers’ houses were often built ‘back-to’back’, with no back garden or yard. This situation gradually improved in the mid-Victorian period, with many new houses being built with small back gardens, such as mine on Radnor Street. I also learnt that in 1848 a Health Act was passed which led to laws requiring access lanes to be built for the removal of waste from houses – there were no flushing toilets in those days! The original drainage channel can still be seen in the passageway at the back of my house. 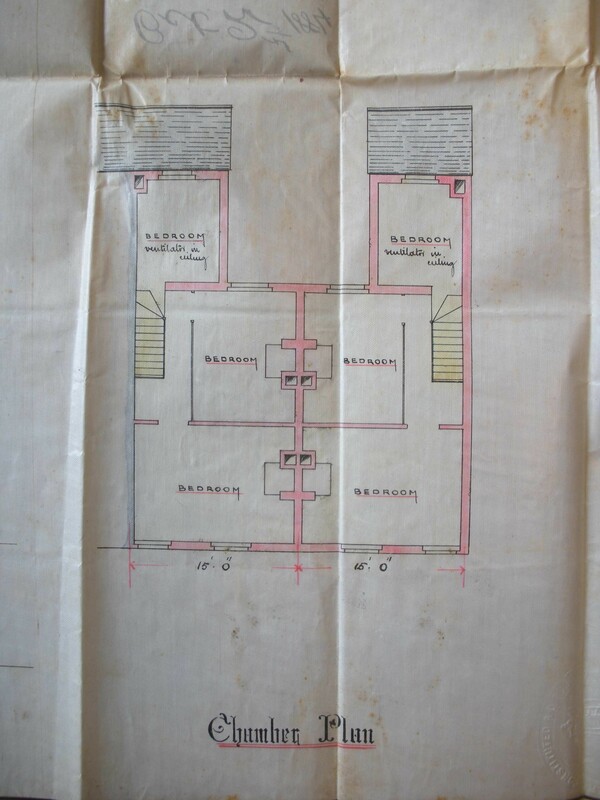 My research suggested that there may be some record of Building Regulation applications from when the house was first built, so I went back to the Swindon and Wiltshire History Centre to have a look at the local council records. 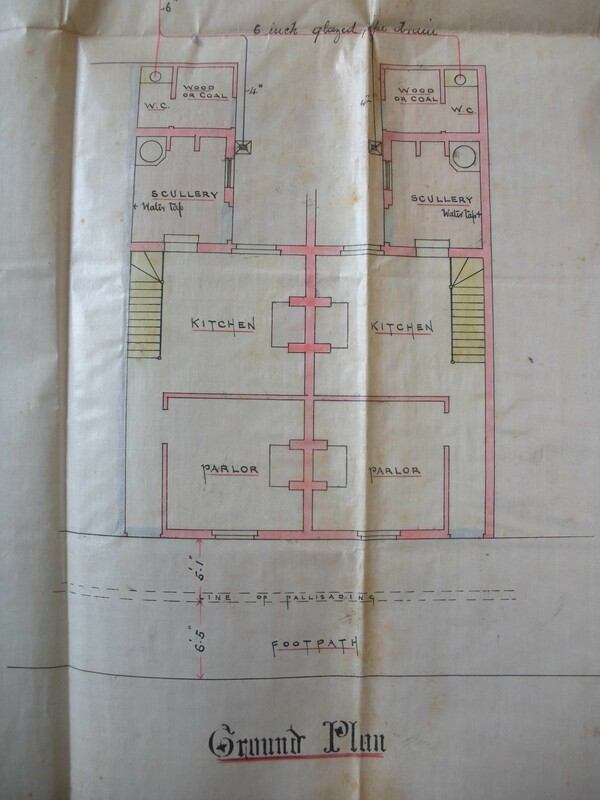 Although I didn’t find any drawings of my house, I did find the original builder’s drawings of other houses in my street, all of which are almost identical. These showed the design of the front of the house, which confirmed my suspicion that the downstairs front window had at some time been replaced with a larger version. Front Elevation. G24/760/791 Copyright Swindon Borough Council, care of Wiltshire and Swindon Archives. 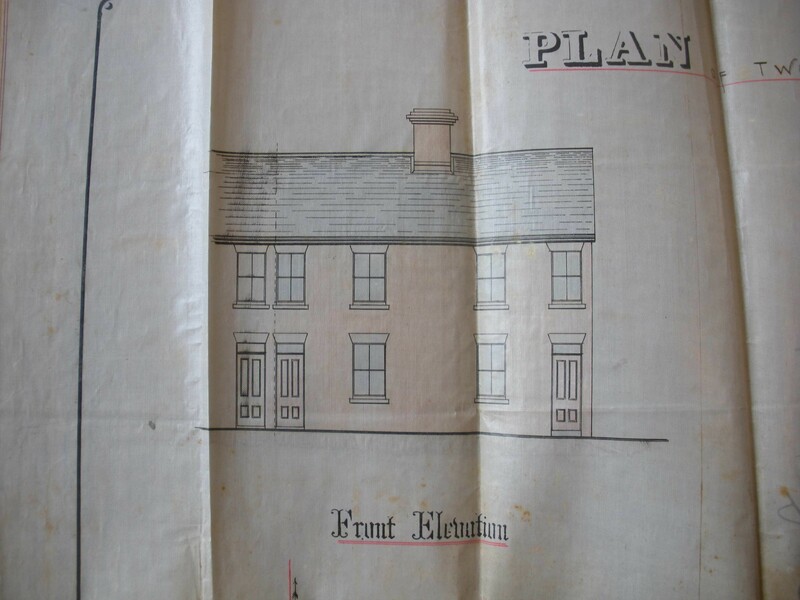 I also found the original plans of houses in the street, which showed how each room would have been used in the Victorian period. At that time the ground floor would have consisted of a parlour at the front, with a kitchen behind. The parlour would have been kept for special occasions, while most of the day-to-day living would have taken place in the kitchen. What is now the kitchen was originally built as a scullery, and there was a lean-to containing a toilet and woodshed attached to the back of the house. Upstairs were three bedrooms, the two larger containing fireplaces to heat the rooms. The fireplaces have since been removed, and the smaller bedroom has been converted to a bathroom. Ground Floor Plan. G24/760/791 Copyright Swindon Borough Council, care of Wiltshire and Swindon Archives. First Floor Plan. G24/760/791 Copyright Swindon Borough Council, care of Wiltshire and Swindon Archives. I next started to look at the structure of the house itself. I had discovered when taking up the floorboards on the ground floor that there was a large space underneath. Some crawling around with a torch showed me the foundations of the house. I found a slate damp-proof course and the original ventilation grilles used to help air circulate under the building. Both of these features were common from the mid 19th century. Further investigation under the floorboards led to the discovery of some old steps that would have led from the kitchen to this basement area, and the remains of a small door or hatch which was now blocked by a patio. This would have been the coal cellar when the house was originally built. My research had shown that my house was a typical terraced worker’s house of the mid to late 19th century. The discovery of the original drawings of similar houses on my street helped me to understand how the different rooms had been used, and what changes had been made over time. Few of the original features survived above ground, but the investigation of the basement had uncovered some hidden evidence. Alongside this, I had found a Christmas card dated 1897, and addressed to ‘Louisa’. I decided that my next step would be to find out who Louisa was, and who else had lived in the house before me. Our family is related to the praters who owned Nunny Castle and many other famous families of nobility that our family married into. HI there. Really interesting blog! I have recently moved into a terrace house in London and we have a cellar but seem to be the only house on the street that does. We also have a different layout to everyone else, which is really odd because they are all identical (literally 50+ houses all the same layout except ours). We are in the middle of the terrace so don’t seem to be a later ‘add on’ and we know the house was originally built in the 1790’s so its really peculiar. Just wondered if you had come across anything like this before and wondered if you might have an explanation for it? Thanks so much! Hi Heather, this does sound interesting. Have you tried looking in your local library or archive? Perhaps there is a local history group who may know more. Hopefully this blog post, and others in the series will give you more research ideas.